As you may or may not be aware the British royal family is about to have a wedding, the marriage of St Diana the peoples princess’s son to someone or the other. The hope is that this time a royal marriage might be less disastrous than most of the family’s recent weddings which have not lasted long, caused enormous scandals, and even worried MI5 the British secret service and it is possible the happy couple have been more or less married in common law since they shacked up together at university. So to celebrate ‘the occasion’ as some would call it, the merchandising department of Buckingham palace has been busy giving the regal nod, for a ‘consideration’ to all sorts of tat that is in the shops now, including some sort of dreadful game from the bride’s family who are as eager as the groom’s family to cash in on their daughter’s good fortune, as they probably see it. Obviously with every merchandising ‘event’ from Disney Movies to well err Pixar movies the quality of the merchandising has to be monitored carefully by the rights holder so that the ‘right’ impression of the event and the status of those involved is forever carved in plastic. 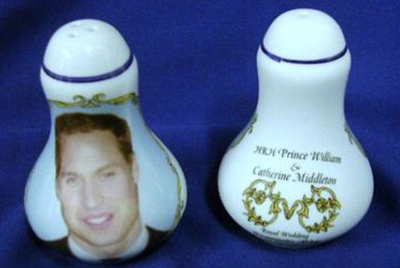 The merchandising mangers in Buckingham Palace have been careful to ensure that the image of the ‘happy couple’ and their royal relations is one that creates the right impression and so they have only licensed “appropriate” merchandising. 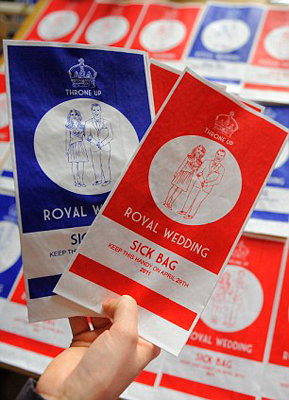 Here for your delight, if you really adore rubbish, is a selection of the royal wedding merchandising that seems to have slipped through the net and not been given the royal seal of approval, which is odd because the selection beautiful sums up the regally happy couple, the family into which the bride is marrying and indeed the ‘entiresome’ event. Let me explain the word ‘entiresome’ it’s a newly invented word (I invented it for this article in fact) and it’s used to explain, in one word, something that’s not only ‘entirely’ ‘tiresome’ but also everything that is to do with it is as well. So here for your pleasure are just a few merchandising items that I think beautifully sum up the happy event with a commentary where ‘unnecessary’ tee hee! If you are like me the first example of royal wedding tat is something you really couldn’t do without. I am sure that you will agree with me I can’t understand why these uncannily lifelike moulded plastic replicas of the royal family and the happy couple weren’t approved by Buckingham Palace! It’s sad that a lot of Chinese workers hard work has it would seem gone to waste, still i believe there is one scrap of silver in the lining of the story and that is that the models are recyclable. 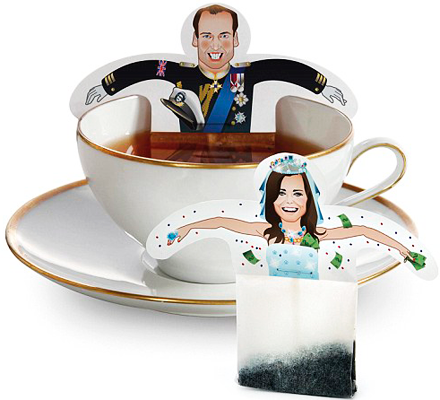 It is a mystery to me why these excellent single cup tea bags haven’t seen the royal nod, the images look, let’s face it, very much like the royal subjects especially wills and tea is the national drink of the UK. Just look at the craftsmanship that went into producing the salt cellar below and then think about the poor souls who slaved away for little or no wages to help celebrate the happy occasion, I feel for these people when I think their exquisite commemorative condiments were not on the offical list of rubbish that is being sold to help everyone celebrate this ‘momentous’ occasion. I have to say I am using the word ‘momentous’ in an entirely new what here because I hope that when used in the same sentences as the words ‘royal wedding’ it will come to mean something that is forgotten in a moment. Last but not least The Cat and his friends have produced their very own tribute to the happily royal couple ladies and gentlemen we give you dave the Cat and Crown! 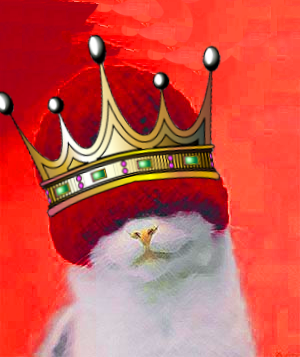 Dave the Cat as always is elegant, tasteful and regal in a bobble hat. If you would like to purchase a copy of Dave the Cat’s commemorative picture you can do so reply to this blog or write to me The Cat at thecat@thecatsdiary.com for details. If you have bought or want to buy any of the official or unofficial tat that is on sale to commemorate this happy occasion do let me The Cat know and I will arrange for someone to visit you and provide counselling. Now that headline got you reading, didn’t it? Well let’s face it that’s what headlines are for. I wanted to draw your attention to a very good pal of mine Marcie who actually does live with a Pig called Andrew (named after the Duke of York obviously and bearing a remarkable resemblance to his namesake) to be more precise is a piglet, but that is because he has never grown up – what a coincidence that his humans named him Andrew after a fat useless twerp who didn’t grow up either. Poor Marcie has to put up with all sorts of indignities and displays of err… pigishness but she has come to learn to live with most of Andy’s antics and happily Andy likes to travel a lot and that means that Marcie has the run of the place when he is away. But when he comes back all hell breaks loose, as you can see below, when there is just the hint of a rumour that there might be a full trough for him outside to sink is little piggy snout into he is up and away, occasionally this bolt for the outside sometimes coincides with Marcie going out of her Cat flap.